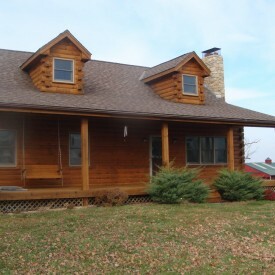 The best log home restoration company in the Cuba MO area is 888-LOG-GUYS! With our professional staff and experienced crew, our services include your 100% satisfaction with our work. With over 15 years in the log home care business, we know how to restore log homes, repair log homes, improve log homes, and maintain log homes to top quality. We want you to love your log home, and it is our mission to help you and every log home owner! 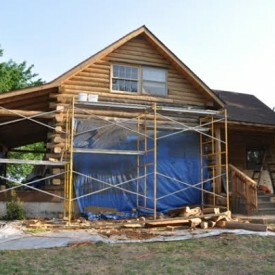 Our log home restoration process starts with media blasting or stripping the old stain before sanding the logs for a smooth finish (as an option). Next comes cleaning the logs with a borate treatment and then chinking or caulking in between the logs. Finally, staining with a topcoat is the last step to make your log home look even better than new! Call 888-LOG-GUYS to find your personalized restoration process for your log home, or request to speak with an estimator from our website! Our crews have repaired or replaced thousands and thousands of feet of log that have been affected by log rot, water damage, weather damage, bug or insect damage, and bird damage. Your best option is having 888-LOG-GUYS fix your log home to ensure it is in top-notch quality and stays in great shape. There is no need to worry about the condition of your log home! Call us or request an estimate from our website! 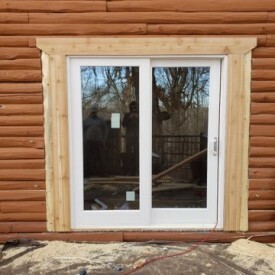 Proper chinking or caulking is what protects your log home from water coming through your walls, bugs or insects invading your log home, or air drafts sneaking through your windows. If you need a log home care company in the Cuba Missouri area that can close those gaps in between your logs, then look no further than 888-LOG-GUYS! Contact us by phone or through our website to find an estimate! You take great pride in your log home, and you have wondered about what you can do to improve it. Take your ideas to 888-LOG-GUYS to see how we can make your dreams a reality! We can build log railings! We can construct log staircases! 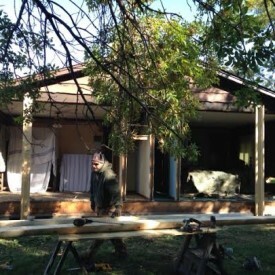 We can build decks or patios or porches! If you have other log home construction ideas in mind, then give us a call! If you need an estimate, you can request one from our website! A log home cannot be neglected when it comes to maintaining it. But, no worries! 888-LOG-GUYS has the knowledge and resources to keep track of when your log home needs to be cleaned with a new coat of stain and sealed with a top coat. Please ask us to take charge of the upkeep of your log home! You can give us a call with questions on what is needed to keep your log home healthy, or you can also request an estimate from our website today!